This is the third in the series of guides on Intellectual Property for Business. It focuses on patents, a crucial tool to enable a company to draw maximum benefit from new technological ideas. The study provides an overview of the Norwegian national innovation system with a special focus on SMEs and their use of the intellectual property system. The study provides valuable empirical data on patent and trademark applications by size, location and sector. The methodology and analysis used in the study and its conclusions and recommendations, while focusing on the Norwegian situation, will be of great interest to all those concerned with ensuring that SMEs are able to make the most effective use of the tools available to them through the intellectual property system. This publication provides practical guidance on the key areas where business membership organizations can integrate intellectual property into their services. This user-friendly handbook is written to support a wide range of basic to more advanced intellectual property services and contains a large number of references to online resources. The National Study on Intellectual Property and Small and Medium Sized Enterprises - India, under the WIPO Development Agenda is a study that has relied on information and data collected through surveys, annual reports of the Office of Controller General of Patents, Designs, Trademarks and Geographical Indications, Government of India; publications of Government of India, other published research reports and studies and interviews and opinions of experts. This is the fourth in the series of guides on “Intellectual Property for Business.” It provides an introduction to copyright and related rights for business managers and entrepreneurs. It explains, in simple language, mainly those aspects of copyright law and practice that affect the business strategies of enterprises. 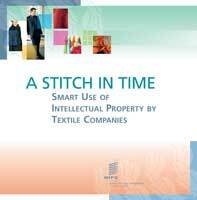 By relying on a wide range of short case studies taken from traditional as well as modern enterprises, this booklet provides a snapshot of the value of effective use of the different tools of the intellectual property system (Industrial designs, copyright, patents, trademarks, geographical indications, trade secrets) for enhancing the competitiveness of products in the textiles, clothing, footwear, and fashion industries, both in the domestic and export markets. The Guide is designed to address the practical business needs and concerns of non-specialists who are required to deal with "licensing in" or "licensing out" technology, be it directly or indirectly. A guide in the form of questions and answers dealing with intellectual property issues, aimed at small and medium-sized exporters and trade support institutions. It explains basic concepts and principles regarding intellectual property rights; covers questions relevant to ownership of rights by employees, contracting, licensing and technology transfer; highlights the importance of intellectual property issues when drawing up business, marketing and export plans and strategies; deals with intellectual property protection abroad; looks at the link between intellectual property and quality regulations, standards, packaging, labeling and electronic commerce; considers how to conduct a valuation of intellectual property rights and how to deal with intellectual property disputes. A Guide dealing with the relationship between successful marketing of crafts and visual arts, and the appropriate use of intellectual property system instruments - pointing to situations where obtaining formal intellectual property protection ought to be considered; explains how to implement marketing and intellectual property strategies within a business framework and marketing management process; presents case studies and examples of managing intellectual property assets in marketing from the craft and visual arts sectors in developing countries; includes bibliographical references. The main objective of this Study is to outline and assess from an economic perspective the major copyright-related economic sectors and activities in the MERCOSUR countries (Argentina, Brazil, Paraguay, and Uruguay) and Chile.